From the beginning of Marvel’s Guardians of the Galaxy, from the very first scene, the question of who is Peter Quill’s (Chris Pratt) father is part of the landscape. And again, at a key point near very end of the movie, Michael Rooker’s Yondu makes a remark about the absent father. The movie essentially opens and closes with this idea, leaving you to speculate about the matter, and well aware that it is going to figure prominently in the already announced Guardians of the Galaxy 2. 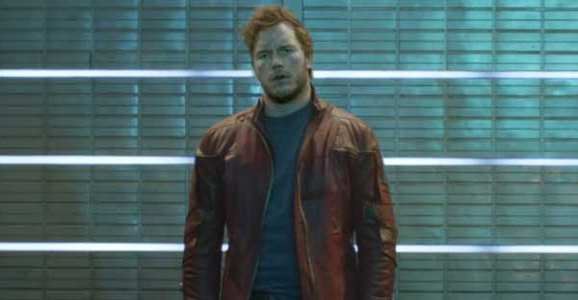 Writer/director James Gunn just dropped some hints about Star-Lord’s parentage, and it isn’t what you might normally expect. Quill’s mother, on her deathbed, refers to his father as an angel from heaven. Because this is a sci-fi movie, you automatically infer that what she assumes is one of the heavenly host is, in reality, an alien from space. In the comics his father is exactly that, J’Son of Spartax, the emperor of the Spartoi Empire. There have been a lot of documents passed around about who Peter Quill’s father is between a select two or three of us. That’s been part of the plan since the beginning, that’s something I had to work out before we shot the screenplay. We wanted to make sure Yondu’s place in everything made sense and it does, so it’s all very specific stuff. It’s definitely not the character who it is in the comics, I’ll say that much. Without coming out and saying exactly what he means, Gunn, in a roundabout way, confirms that J’son is not Quill’s father. If you’re wondering, especially after Gunn mentions him by name, if Yondu could be dear old dad, that’s not the case either. While he definitely filled the role of father figure, he specifically references someone else as Quill’s dad, so that’s off the table, too. There are tons of theories floating around about this topic, written by people far more knowledgeable about the Marvel Universe than I am, so I’m not even going to try to open that can of worms. But there are two big theories that I feel comfortable addressing. One is that Thanos is his dad, which is a significant stretch. He’s already involved enough being the adopted father of Gamora (Zoe Saldana) and Nebula (Karen Gillan), adding another member of the brood is far fetched. And it also seems awkward and uncharacteristic that Thanos would travel to Earth and hook up with an earth woman, not to mention that Quill’s mom says her lover was beautiful and bright, and Thanos is an ugly, dark dude. 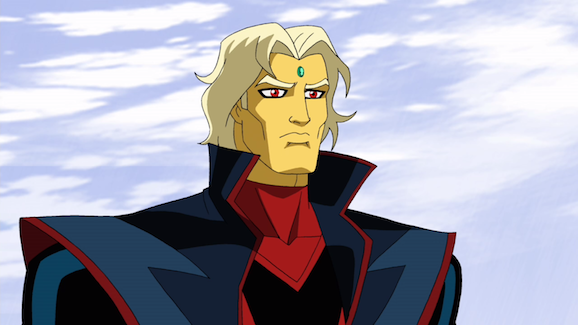 Theory number two is that Quill’s father is Adam Warlock. Also known as Him, Warlock was created to be the perfect human, the pinnacle of evolution, but after rebelling against his makers, he heads to the furthest reaches of space. And he’s also in the first movie, sort of. You catch a glimpse of his cocoon in both the scenes at The Collector’s lair. So the seed has already been planted, and when you consider that Thanos is supposed to become the looming big bad in the Marvel Cinematic Universe, this also makes sense because Warlock becomes a key part of the group that watches over the Infinity Stones, and comes into direct conflict with Thanos. He will show up [in the sequel] if he helps our story and he will not show up at all if not. 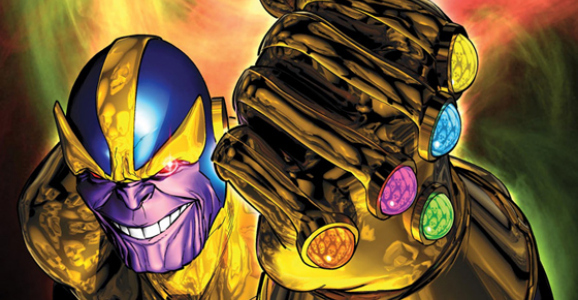 Thanos is not the most important thing in Guardians 2, that’s for damn sure. There’s the Guardians themselves and other threats the Guardians are going to be facing that are not Thanos. That doesn’t necessarily mean that Warlock won’t show up, or that he won’t be Star-Lord’s dad, it just means that the conflict between he and Thanos won’t materialize until later, if that’s the route they go. It also sounds like, as much as Marvel has touted Thanos’ involvement in the future, that he’s just being pushed farther and farther into the background. We know he won’t be in Avengers: Age of Ultron, and if he’s not much of a factor in Guardians 2, when the hell are we going to see him? People are already getting sick of him not doing anything. You get that he’s supposed to be this looming force of darkness and evil, pulling strings of everything, and that his presence leaves a shadow over the entire MCU, but up to this point, he’s done exactly squat. He’s menacing to be sure, but all we’ve seen him do is not blow up a planet for Ronan. If he’s going to continue to be a presence, the studio really needs to do something of note with him. I didn’t read into it that J’son isn’t Quill’s dad, maybe he means J’son isn’t King of Spartax. Either way it’s kind of a bummer that it’s going to be a drastic change. But then again, the comics pretty much had all this stuff already established and fleshed out, so I guess I could understand the change seeing as how we’re still getting to know newish characters in a newish galaxy. Yondu was from the Original Guardians of the Galaxy set in the 30th century. It makes sense that Star Lord’s father would be Starhawk the one who knows. The nick name of Star lord would fit the son of a god like being with the name “Star”. He was very dickish as when he dies his memories are returned to his baby self. He knows that his wife who was raised as his sister is going to grow to hate him but he plays along anyway. He keeps reliving his life over and over making him both traped and a know it all. Another guess would be Vance Astro who was a human that left earth in 1988 to go to Alpha Centauri. To protect him from aging, Astro was covered with a skin-preserving copper alloy (which was upgraded with adamantium in the Guardians of the Galaxy series) body-suit, and his blood was transfused with a kind of preservative fluid. He showed up in 3007 making him an ancient one. He traveled back to the 20th century to look after his child self. Who is to say he didn’t have a kid of his own while there?